The idea for Colossal sounds exactly that: “colossal.” A woman in the US can sometimes, when she’s drunk and in the right place, become a giant monster in Seoul, South Korea. Add to that Oscar-winning actress Anne Hathaway, and it sounds like a Hollywood blockbuster. But that’s not what Colossal is at all. Massive action scenes of monsters destroying cities are secondary to Colossal’s personal conflicts, mostly the ones between Gloria (Hathaway) and her old friend Oscar (Jason Sudeikis). The movie takes a high-concept idea and brings it down to Earth—which is what Vigalondo has done his whole career. Since 2007, the director has been making strong feature films that somehow haven’t broken out. His first film, Timecrimes, is a cult favorite but didn’t have mainstream success. He then made Extraterrestrial and Open Windows, both of which have original premises and good reviews, but didn’t find an audience. Vigalondo doesn’t care. That’s not who he is. And any praise or problems that arise from Colossal, he takes full responsibility. The one wild card in that is Hathaway, a bonafide movie star, who joined the film when her agent read the script and simply recommended she do it, money be damned. “Colossal was playing like this kind of joke for some people in the [movie] universe,” Vigalondo said. But when Hathaway was attached, that changed. People took notice, and stars like Sudeikis, Dan Stevens, and Tim Blake Nelson joined the production. It also doesn’t hurt that this giant monster movie also contains some very personal, very realistic issues: domestic abuse, alcoholism, failure, regret, and more. 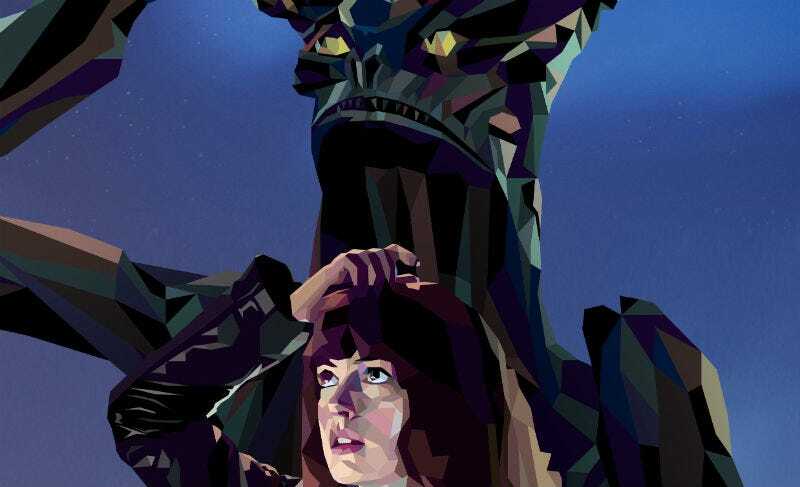 Colossal takes a fun genre concept but uses it for something much more real, and that was exactly the point. Vigalondo doesn’t think Colossal has one single meaning. It can reflect many things to many different people depending on their experiences. However, he was very careful to not explain how and why this character becomes a giant monster. He admits it’s a question fans will have, and the movie does very tangentially tease an explanation, but that was not the story he wanted to tell. You know, minus the whole giant monster thing. Colossal opens in limited release April 7.